Home › Andaman teal › Chinese pond heron - Ardeola bacchus. The Chinese pond heron (Ardeola bacchus) belongs to the family Ardeidae. The Chinese pond heron species breed in Eastern Russia, Eastern China, Japan, Northeast India and North Myanmar. These heron species winter in Andaman Islands, Malay Peninsula, Indochina and Indonesia. The Chinese pond heron is closely related to Ardeola grayii (Indian) A. idae (Madagascar), A. ralloides (squacco) and A. speciosa (Javan). The Chinese pond heron is medium sized bird, measuring 40 to 52 cm in length with a wingspan of 80 to 90 cm. It has a white wing and yellow bill with black tip. The legs and eyes are colored yellow. The head, throat and neck are brick red in breeding plumage. The back has bluish grey breeding plumage. These bird species inhabit paddyfields, swamps, lakes, riverbanks, saltwater wetlands, mangroves and tidal flats. 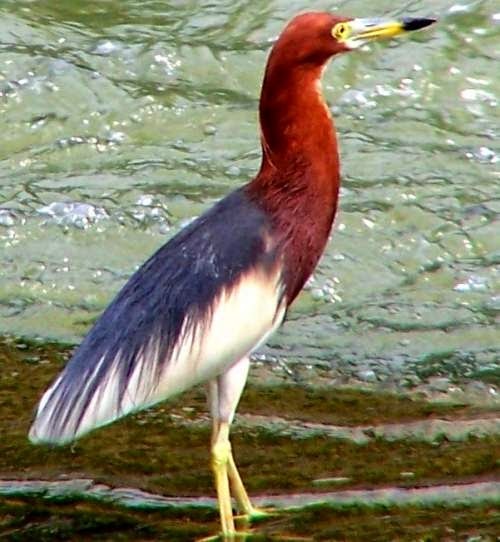 The Chinese pond heron species feed on insects, fish and crustaceans. The Chinese pond heron species nest in mixed heron colonies. It lays a clutch of 3–6 blue-green eggs. Parents incubate the eggs and feed the young ones. Breeding populations of Chinese pond heron species occur in Eastern Russia, Eastern China, Japan, Northeast India and North Myanmar. These bird species winter in Andaman Islands, Malay Peninsula, Indochina and Indonesia. They are migratory birds, breeding in northern regions and migrating southwards for wintering. These bird species have vast range and big populations are seen in breeding grounds. Habitat degradation may be the threat in the near future. The IUCN (International Union for Conservation of Nature) has categorized and evaluated these bird species and has listed them as of "Least Concern". Current topic in Birds of India: Chinese pond heron - Ardeola bacchus.